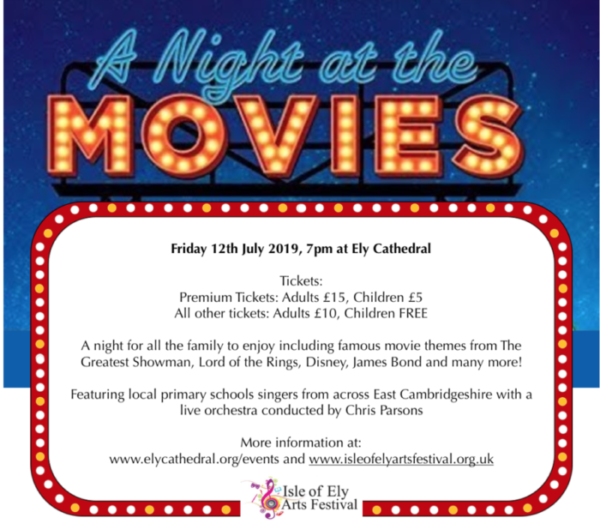 The Isle of Ely Arts Festival are delighted to present ‘A Night at the Movies’ in the glorious surroundings of Ely Cathedral. This event promises to be a night for all the family to enjoy with hits from movies from across the years. It will include a medley from ‘The Greatest Showman’ sung by local school children and an assembled community choir. Other movie favourites to listen out for will include: Lord of the Rings, Harry Potter, a Disney medley, Jurassic Park and many more! Conductor Chris Parsons will lead a specially formed Festival orchestra in a community led performance for all to enjoy!